TL;DR: Having achieved much of what I hoped when running for the TAG six years ago, it’s time for fresh perspectives. Therefore, with my deep and enthusiastic support, Google has nominated Alice Boxhall in the current election. If you work at a W3C member organisation, please seriously consider making Alice your first vote. For the past 6 years, I’ve served as a member of the W3C’s Technical Architecture Group (or “TAG” for short). I’m proud of the work we’ve done in that time. There’s less “spooky action at a distance” in the web platform today, and many designs have been greatly reworked due to our collaboration with working groups. Improvements to WASM’s JS API to avoid security and performance problems. The ongoing effort to review many legacy features in HTML to identify areas for improvement. Guidelines for designing Web Components in such a way as to keep the web extensible for the long-haul. To help designers avoid commonly spotted issues, the TAG has extracted a growing set of Design Principles from the dozens of reviews we have conducted over the past 6 years. All of this is in addition to the TAG’s continuing work of weighing in on issues that affect the architecture of the web via Findings. The TAG’s recent track record of collaboratively improving designs and preventing likely disasters has cemented its value to the web community. We reformed to the work mode of the group and demonstrated so much impact that, despite having no formal power, the TAG has earned an influential place in Blink’s feature development process. It’s against this backdrop that I’m pleased my colleague Alice Boxhall has decided to run in the current TAG election. Due to W3C rules surrounding representation from a single firm (a topic for another time), we cannot both stand. This means the upcoming TAG meeting in February in Tokyo will be my last — and I hope Alice’s first. Why Alice, and why now? First, Alice brings a new perspective to the TAG thanks to her dedication and leadership in accessibility. Her work on Chrome’s a11y systems and her development of the Accessibility Object Model speak to the depth of her understanding and willingness to solve gnarly, deep problems within the platform. This is the sort of expertise the TAG needs, and with changes to HTML’s governance, it’s important that the a11y community has a voice within the web’s most influential design review body. Second, in addition to broadening the skills represented within the TAG, it’s important the TAG is staffed with members who will “do the work”. The TAG’s authority (such as it is) resides in its reputation for collaborative, constructive, timely design feedback. Having worked with Alice for more than 6 years, I am certain her dedication and working style are well suited to the rigors of the role. Lastly, this nomination represents a continuing commitment from Google and the Chrome team to the health and quality of web APIs. Some AC members might worry that my stepping back from serving on the TAG indicates less emphasis on it from Chrome and the Chromium community. Nothing could be further from the truth. I continue to serve as Tech Lead for Google’s overall web standards efforts and we maintain a keen interest in the good-functioning of the TAG — particularly now that it has earned a place in the critical path for shipping features in Blink. In addition to the usual travel and logistical support I have enjoyed on the TAG, Alice has the backing and support of the entire Chrome Web Standards Team. I trust the TAG will continue to improve the layering, coherence, and usability of the platform; and with your organisation’s support, also it’s accessibility. For these reasons, I urge you to give Alice Boxhall your organisation’s first vote on the currently open AC ballot. These tools let us move faster. Because we can iterate faster we’re delivering better experiences. If performance is a problem, we can do progressive enhancement through Server-Side Rendering. Most unfortunately, this substitution is frequently offered to shield the preferences of those in a position to benefit at the expense of folks who can least afford to deal with the repercussions. Polluters very much prefer conversations that don’t focus on the costs of emissions. Shifting the conversation away from actual user experiences to team-level advantages enables a culture in which the folks who receive focus and attention are developers, rather than end-users or the business. It naturally follows that teams can then substitute tools for goals. This has predictable consequences, particularly when developers, through their privileged positions as expensive-knowers-of-things-about-computers, are allowed to externalize costs. And they do. Few teams I’ve encountered have actionable metrics associated with the real experiences of their users. I can count on one hand the number of teams I’ve worked with who have goals that allow them to block launches for latency regressions, including Google products. Nearly all developers in the modern frontend shops do not experience performance constraints until it’s too late. The brakes aren’t applied until performance is so poor that it actively hurts the business. 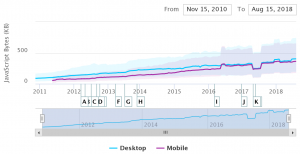 Median mobile sites have gone from ~50KB of JS in 2011 to more than 350KB today. That unzips to roughly 2MB of script. There have been positive signs that this message has taken root in certain quarters, but it has not generally changed the dynamic. Despite the heroic efforts of Polymer, Preact, Svelte, Ionic, and Vue to create companion “starter kits” or “CLI” tools that provide the structure necessary to send less JS be default, as many (or more) JS-heavy performance disasters cross my desk in an average month as in previous years. Perhaps my arguments have not been effective because I hold to a policy of not posting analyses without site owner’s consent. This leaves me as open to critique by Hitchen’s Razor as my dataless interlocutors. The evidence has never been easier to gather and the aggregates paint a chilling picture. But aggregates aren’t specific, citable incidents. Video of a single slow-loading page lands in a visceral way; abstract graphs don’t. And the examples are there, many of them causing material, negative business impact. A decent hedge-fund strategy would be to run a private WPT instance and track JS bloat and TTI for commercial-intent sites — and then short firms that regress because they just rewrote everything in The One True Framework. Seeing the evidence instills terror, yet I’ve been hamstrung to do more than roughly sketch the unfolding disaster while working behind the scenes with teams. There is, however, one exception to my rule: the public sector. Specifically public sector sites in countries where I pay taxes. Today, that’s the US and the UK, although I suspect I could be talked into a more blanket exception. So I’m going to start posting and dissecting a lot more traces of public sector work, but the goal isn’t to mock or shame the fine folks doing hard work for too little pay. Rather, it’s to demonstrate what “modern frontend” is doing to the accessibility of the web — not in the traditional “a11y” sense, but in the “is going to this site reasonable for its intended users?” sense. That is, I will be talking about this as a proxy for the data I can’t share. Just wanted to send my 💌 and 🙏 to the lovely souls at @gdsteam. My hope, instead, is that by showing specific outcomes and the overwhelming volume of these examples it will become possible to talk more specifically about what’s wrong, using and pervasively citing data. I hope that by talking about what it means to build well when trying to serve everybody, we can show businesses how short they’re falling of the mark — and why those common root-causes in JS-centric development are so toxic. And if the analysis manages to help clean up some public sector services, so much the better; we’re all paying for it anyway. Code.gov loading on a fast connection on an iPhone 8 vs. an Android Go device. This isn’t Plan A, but neither was the CDS talk in ’16 that got everyone so upset. I don’t like that this is where we are as a community and as a platform. I hate that this continues to estrange me from the JS community. We need tools. We need frameworks. But we need to judge them by whether or not the deliver a better developer experience without fundamentally impairing the user experience. We must get to JS-neutral (or, my preferred, Time-to-Interactive-neutral or negative) tooling. Frameworks and tooling need to explain clearly, in small words, with reproducible instructions how they deliver under-budget experiences, how much room is left after their budgetary cost, and what devices and networks their tools are appropriate in. This will mean that many popular tools are relegated to prototyping. That’s OK. This is very much Plan D…or E. But the crisis is real and it isn’t inevitable. It is not exogenous. We made it, and we can fix it. To get this fixed, we need to confront the “developer experience” bait-and-switch. Tools that cost the poorest users to pay wealthy developers are bunk. To do better, we need to move the conversation to an evidence-based footing. I wish the arguments folks made against my positions were data-driven. There’s so much opening! Perhaps a firm is doing market analysis and only cares about ever reaching users who make more than $100K USD/yr or who are in enterprise settings. Perhaps research will demonstrate that interactivity isn’t as valuable as getting bits on screen (the usual SSR argument). Or, more likely, that acknowledgement (bits on screen) buys a larger-than-anticipated amount of perceptual padding (perhaps due to scanning). Perhaps the global network landscape is shifting so dramatically that the budget for client-side JS runtime has increased. Perhaps the median CPU improvement that doesn’t look set to materialize until 2021 at the earliest will happen much earlier; i.e., maybe the current baseline is wrong! But we aren’t having that conversation. And we aren’t going to have it until we identify, call-out, and end the “developer experience” bait-and-switch. Thanks and apologies to Ade Oshineye, Ojan Vafai, Frances Berriman, Dion Almaer, Addy Osmani, Gray Norton and Philip Walton for their feedback on drafts of this post. “Part 1: The Lay of The Land” discussed persistent challenges in standards and forces that give rise to misunderstandings. It also described the ecosystem dynamics that make change difficult, even before considering the varying firm-level strategies of browser vendors. …at least early on. Most ideas and designs aren’t good, and most of the ones we eventually accept don’t start good. Spaces that allow ideas to spring to life and quietly pass into time, or radically change without undue drama, are essential to improving our outcomes. Nothing good happens without both groups at the table. Pre-determined outcomes rarely yield new insights and approaches. Long-term relationships of WG participants can also be toxic to new ideas. Nobody takes their first tap-dancing lessons under Broadway’s big lights. Start small and nimble, build from there. I’ve never witnessed early design work go well without in-person collaboration. At a minimum, it bootstraps the human relationships necessary to jointly explore alternatives. It’s attractive to think that design can (or should) happen within a formal Working Group. A well-functioning WG should include both developers and implementers, after all. Those groups often have face-to-face meetings, and the path toward standardisation is shortest in those venues! But it doesn’t work; not often enough to be useful, anyway. Starting your journey there leads to pain and failure. Why? The deck is stacked against design-in-committee, both structurally and procedurally. Structurally, it is the job of a Working Group to evaluate proposals for inclusion in a specification. The basis for inclusion in nearly all standards I know of is not rigorous or scientific. Evidence is not (yet) a compelling argument. The norms of standards organisations are set, largely, by social cohesion amongst those working to improve the systems they maintain. The older the specification and the more stable the composition of the group, the harder it is for new ideas and people to enter with credibility. A further difficulty for non-implementers (in another universe, “customers”) within these groups is the information asymmetry inherent in the producer/consumer relationship. Implementers feel a responsibility to resist designs they feel would be detrimental to either their architecture or their competitive position. New ideas have to enter this environment roughly “done” to even get on the agenda. Procedurally, it’s the responsibility of chairs and the overall group to make progress towards the promised deliverables. Working Group charters typically set up a scoped set of deliverables and a time-table, and while there’s lots of play built into these things, groups that don’t continue to produce new versions on a regular basis are considered problematic. Problematic groups tend not to continue to receive the organisational support they require to continue. Failure and iteration are the lifeblood of good design, but these groups are geared for success. They aggressively filter out new ideas to preserve their ability to ship new versions of specs. Once something is locked into a WG agenda, it’s “in”. This is inherently anti-iteration. If you’ve never been to a functioning standards meeting, it’s easy to imagine languid intellectual salons wherein brilliant ideas spring forth unbidden and perfect consensus is forged in a blinding flash. Nothing could be further from the real experience. Instead, the time available to cover updates and get into nuances of proposed changes can easily eat all of the scheduled time. And this is expensive time! Even when participants don’t have to travel to meet, high-profile groups are comically busy. Recall that the most in-demand members of the group (chairs, engineers from the most consequential firms) are doing this as a part-time commitment. Standards work is time away from the day-job, so making the time and expense count matters. Before anyone gets into the room, everyone knows what the important topics will be, and if precious time is taken from resolving those issues — particularly to explore “half baked” ideas — influential folks (and the teams they represent) will be upset. Not a recipe for agreement. The idea that a public, agenda-driven, minuted, chaired forum with a full docket and a room full of powerful decision-makers primed to say “no” is where your best design work will happen is barmy. Policies aren’t dreamt up in open session at Parliament, Congress, or the UN; rather they’re presented and voted on, possibly with minor amendments. Note: There are many dysfunctional standards groups; they tend to have lighter agendas or a great deal of make-work. Those groups are unlikely to be well-attended by busy implementers. Groups that can’t keep implementer interest aren’t worth investing time in. This insight is why the Chrome team now insists on doing design work in “incubation” forums. These can be embedded into a WG’s formal process (as at TC39), or in separate forums which are feeders for formal, chartered groups (e.g. WICG or RICG). These derive from our overriding goal: ship the right thing. All too often we’ve seen designs (cough AppCache cough) that could have been improved by listening to available feedback. Design processes without web developers involved tend to fail because they can’t error correct. Implementers most acutely feel the constraints of their system, not web developer reality. Without the voices of web developers, designs tend towards easy-to-build — rather than fit-for-purpose. Group-think too often takes hold, as those represented share the same perspective, making change and iteration harder. Similarly, design efforts without implementers present are missing the constraints that lead to successful design. Proposals without this grounding are easily written off. It’s tempting to get a group together to design future APIs in a vacuum, but without implementers critical mass never forms. So how can you shape the future of the platform as a web developer? The first thing to understand is that browser engineers want to solve important problems, but they might not know which problems are worth their time. Making progress with implementers is often a function of helping them understand the positive impact of solving a problem. They don’t feel it, so you may need to sell it! Building this understanding is a social process. Available, objective evidence can be an important tool, but so are stories. Getting these in front of a sympathetic audience within a browser team is perhaps harder. Thankfully, functional browser engine teams now staff sizable outreach and Developer Relations groups (oh hai, @ChromiumDev, @mozappsdev, MSEdgeDev, and Jonathan!). Similarly, if you happen to work for a top-1k web property, your team may already have a connection to a browser’s partnerships team. Those teams can route thoughtful questions to the right engineers. Other models for early collaborations involve sideline conversations at industry gatherings, e.g. TPAC or BlinkOn. Special-purpose vehicles like W3C Workshops are somewhat harder to organize, but browser engineers are willing to join them. I can’t speak for other vendors, but Chromies are also willing to travel for ad-hoc gatherings to do early design work. Andrew Betts masterfully orchestrated such an event while at the FT, kicking off what became Service Workers. You might not have Andrew’s wealth of connections, but odds are you probably know someone who does. Remember, at the start this is about individuals. Drawing attention to an issue that you think is important means building a small group of like-minded folks. It’s effort to find “your people”, but it’s far from impossible! Next, recognize that the design, development, iteration, and eventual standardisation phases take time. Sometime a lot of time. As a web developer, it’s unlikely that you’ll be able to sustain professional interest in such a process as there’s no practical way it can bear fruit in time for your current (or even next) project. This is not a personal failing, it’s just how the gearing works. You have information that browser teams don’t, but less leverage and time. Setting them on a better course is helping the next person and, if you’re doing this as your profession, may eventually help you too. Don’t feel guilt for needing to drop out of the process at some point. It has gotten ever easier to stay engaged as designs iterate. After initial meetings, early designs are sketched up and frequently posted to GitHub where you can provide comments. Forums like WICG let you provide direct design feedback during development — a very intentional shift by the Chrome and Edge teams to give developers a louder voice when designs are still maleable. Further along the process, Chrome is now running a series of “Origin Trials”, an idea the Chrome team borrowed from Jacob Rossi at MSFT. Origin Trials allow developers to test new features on live sites and shape their evolution. Teams running these trials actively solicit feedback and frequently change them in response. Astute readers will note none of this involves joining a Working Group or keeping up with busy mailing lists. Affecting the trajectory of the web platform has never been easier, assuming you know which side of the amplifier to approach. These relatively new opportunities for participation outside formal processes have been intentionally constructed to give developers and evidence a larger role in the design process. We’ve supported their creation because they help us to separate open design and iteration from standardisation, allowing each process to assist the community in improving features at the point where they are most effective. These processes aren’t perfect by any stretch, and it would be an epic understatement to suggest that the broader browser and standards communities agree with design via incubation outside of formal Working Groups. Maintenance work is a particularly thorny topic. Regardless, the Chrome team has gathered compelling evidence that this is a better way to work. Prizing collaboration, iteration, and evidence has enabled us to shape process to support those values. Incubation and related processes let us be more responsive to developers while simultaneously increasing confidence that features shipped to Stable meaningfully address problems worth solving. Hopefully this series will help you shape the future with fewer misunderstandings. After all, we all want to see the right thing ship. There’s a meta-critique of formal standards and the defacto-exclusionary processes used to create them. This series didn’t deal in it deeply because doing so would require a long digression into the laws surrounding anti-trust and competition. Suffice to say, I have a deep personal interest in bringing more voices into developing the future of the web platform, and the changes to Chrome’s approach to standards discussed above have been made with an explicit eye towards broader diversity, inclusion, and a greater role for evidence. Deep thanks to Andrew Betts, Bruce Lawson, Chris Wilson, and Mariko Kosaka for reviewing drafts of this series and correcting many of the errors within.